Born in London, England on 10 February 1814, the son of an officer of the East India Company. He was educated at Edinburgh Academy and Exeter College, Oxford. He married a daughter of James Marsden of Liverpool. They had three sons. 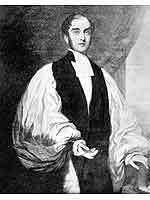 He was ordained a priest in 1838, serving the church in Liverpool and Everton until 1841, when he became vice-principal of St. Bees School in Cumberland. In 1849 he was consecrated Bishop of Rupert’s Land and, in October of that year, reached Red River Settlement. On the day of his arrival the headmaster of the privately-owned Red River Academy died. Bishop Anderson took over the school, re-organized it as St. John’s Collegiate School, and gave the school its motto “In Thy light shall we see light”. This was the first local use of the name St. John’s, later to become widely used in the St. John’s district of Winnipeg. Shortly after opening the collegiate school hebegan the work of St. John’s College by teaching theological subjects to candidates for the ministry. Of the twenty clergymen ordained by Bishop Anderson eight were natives of the North-West. His episcopate was noteworthy for far-reaching expansion of the church’s work. He returned to England in 1864 and resigned his See. Subsequently he became Vicar of Clifton, and Chancellor of St. Paul’s Cathedral. Author of Notes of the Flood at Red River, 1852 (London, 1853); The Net in the Bay, a Journal by the Bishop of Rupert’s Land (London, 1854). He died at Bristol, England on 5 November 1885. He is commemorated by Anderson Avenue in Winnipeg. There are scattered papers held by the Archives of Manitoba and extensive papers in the Diocese of Rupert’s Land Archives. The episcopate of the Right Reverend David Anderson, DD by M. P. Wilkinson, MA dissertation, University of Manitoba, 1950.